Private sessions are available at a location of your choice within three hours travel of the Tucson/Phoenix, Arizona area. Such sessions require a 5 dog minimum ($400). 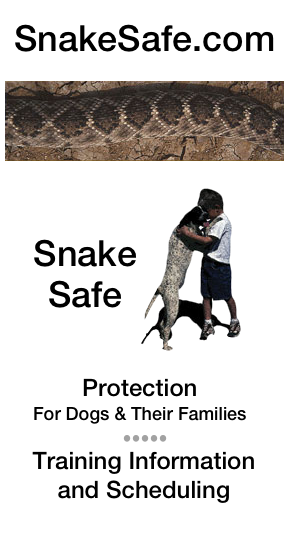 Private sessions with a single dog are available in the Oracle, AZ area for a minimum charge of $200.00. This covers the cost of the required two dog minimum. Private sessions with three dogs are available in the Tucson area for a minimum charge of $300.00. This covers the cost of the required three dog minimum. We accept cash, debit or credit cards and checks. The training is completed in one session which, depending on the number of dogs in the group, can run from 1 1/2 hours to 3 hours. There are no additional follow-up trainings or charges beyond the initial one session expense of $100.00 per dog. The trainings are conducted outdoors. Remember to bring water for you and your dog. For your comfort, also bring a hat, and sunscreen.